Browning X Bolt: Base screws are 6-48 X 1/4″ long. Ring screws are 6-40 X 5/8″ long. Both screws use 7/64 Allen wrench. Super Short action – Outside to outside of rings is 3.79″. Rings are .63″ wide. 4 Hole to hole spacing dimensions are .70″, 2.82″, .70″. Height of mounts from top of receiver to centerline of scope tube is – low .94″, medium 1.06″, and high 1.19″. Mount fits right hand firearms. Short action – Outside to outside of rings is 3.91″. Standard rings have 2 screws per ring and rings are .63″ wide. 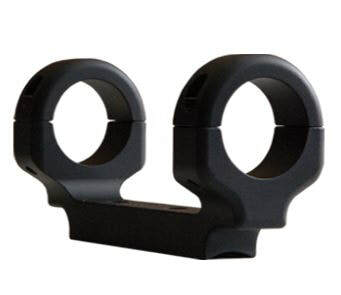 Tactical rings have 4 screws per ring and are .80″ wide. 4 Hole to hole spacing dimensions are .70″, 2.94″, .70″. Height of mounts from top of receiver to centerline of scope tube is – low .94″, medium 1.06″, and high 1.19″. Mount fits right hand firearms. Long action – Outside to outside of rings is 4.58″. Standard rings have 2 screws per ring and rings are .63″ wide. Tactical rings have 4 screws per ring and are .80″ wide. 4 Hole to hole spacing dimensions are .70″, 3.69″, .70″. Height of mounts from top of receiver to centerline of scope tube is – low .94″, medium 1.06″, and high 1.19″. Mount fits right hand firearms.